CALVARY CHAPEL’S CHUCK SMITH JOINING THE EMERGING ECUMENICAL MAGISTERIUM? Apprising Ministries has been discussing what appears to be a new emerging ecumenical magisterium growing up around the Elephant Room of co-hosts James MacDonald and Mark Driscoll. we do not know what was talked about during their breakfast together. All we know is that there was a meeting between these three. 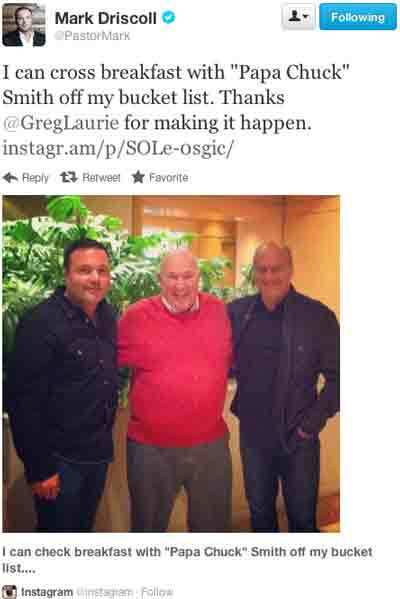 Please take note that it was Greg Laurie that helped make this happen. Vimeo video of this years recent Senior Pastor’s Conference 2012 discussion panel: http://vimeo.com/43699608 At 24:26 “new Calvinism” is brought up which leads right into Mark Driscoll. The thing is Greg claims that most criticism is not based on fact and that people should talk to him about concerns. CALVARY CHAPEL & PURPOSE DRIVEN PASTORS DOING YOGA?